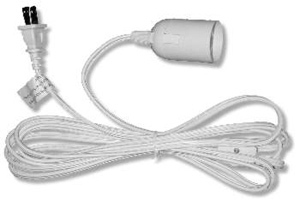 Our cord is 12feet in length, white color, has inline on/off switch and bulb socket. It has a polarized plug for US and Canadian electric systems. Just add your own 40 watt bulb.This will fit any our our lanterns. This cord fits regular size bulbs and any flourescent bulb.